If you’re on a long road trip, or going camping, or staying at a friend’s house, a large, plastic cooler can be a great resource for keeping drinks and food cold. But, what if you’re doing something in which you can’t be stationary? It’s going to be very difficult to lug around a large, hard, bulky cooler everywhere you go. In these cases, it would be wise to carry a soft cooler. Soft coolers are lighter, less bulky, and more comfortable overall, making them perfect for carrying while on a hike or other excursion. But, what makes a great soft cooler? This guide will provide you with that information and more. Polar Bear Coolers is a company dedicated to manufacturing coolers that offer both high performance and excellent functionality. Constructed with close attention to detail, they combine top-notch insulation with stellar portability. The company’s top soft cooler is the Polar Bear Coolers Soft Cooler. 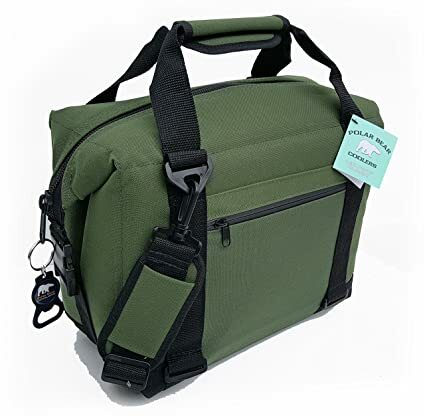 Whether you’re a hiker, camper, or are just looking for something comfortable to carry around with you, this cooler will accommodate you. Weighing in at 3 pounds when empty, it is available in four different carrying capacities, including 6 cans, 12 cans, 24 cans, and 48 cans. The 12, 24, and 48 can capacity coolers come with both a hand handle, and a shoulder strap, while the 6 can capacity cooler comes with just a hand handle. There is also a backpack style available. This wide variety of sizes allows you to purchase a specific cooler for whatever purpose it’s needed. They can be used for anything from long range hiking, to picnics, to large out gatherings. For those of you concerned about the aesthetic aspect of your cooler, it’s important to note that these all come in a variety of different colors and styles, including black, camo, navy, red, and gray. This gives you the opportunity to purchase one that best represents your personal style and preference. Now let’s talk about its general construction and insulation properties. Its exterior is made of a high density foam that prevents its from sweating, helping to keep all of the chill inside, and working to keep your drinks cooler for longer. Helping to keep the outside more durable is a nylon material that is able to withstand a great deal of wear and tear, making it tough, and giving it a very long lifespan regardless of what it’s used for. A zipper placed conveniently on the top of the cooler allows for easy access, leading to a heavy insulated interior. This insulation is very thick, and completely leak-proof, allowing you to pack a bunch of ice without the worry of it melting all over the place. Online reviewers love this cooler for its remarkable ability to keep drinks cool in the heat. One reviewer stated that he left his out in the 90 degree sun for a day without any change in the appearance of the ice. Reviewers also give it credit for its excellent storing ability, noting that a 24 can cooler will actually store 26 to 30 cans, while a 12 can cooler can actually store 16 to 18 cans. Some reviewers complained about how awkward and stiff it was, stating that it was difficult to pack anything other than bottles and cans into it. Other reviewers noted that the positioning of the shoulder strap is a little awkward, making it a little uncomfortable to carry around. However, for short distances, this shouldn’t be much of a problem. And, if you’re wanting to carry it for long distances, you should probably go with a backpack style. Overall, the Polar Bear Coolers Soft Cooler is a top-notch soft cooler with a lot of carrying space. It may not accommodate food as well as other coolers, but as a can-only cooler, it’s as good as you’re going to find. Offering premier insulation and non-sweat technology as well as excellent carry-ability, the Polar Bear Coolers Soft Cooler is excellent for hikers, campers, and anyone else who needs to cool beverages on the go. If you’re interested in reaping its benefits, you can purchase it for around $60.00 on most online retail sites. Coleman has always been a leader when it comes to outdoor equipment. Whether its lanterns, tents, outdoor grills, or coolers, the company makes some of the top gear when it comes to outdoor products. One of Coleman’s premier products is their Coleman 16-Can Soft Cooler With Hard Liner. It combines excellent storage space with stellar insulation value to create a cooler that is both very useful and extremely high performing. First, let’s talk about its storage abilities. Measuring in at around 11 inches x 11 inches x 8 inches and weighing around 1.5 pounds when empty, it is capable of holding 16 cans of pop or beer; 2 stacks going 4 wide and 2 deep. After the cans have been stored, it still provides quite a bit of room for either ice or ice packs. An exterior pocket provides you with even more storage, and is appropriate for holding small items that don’t need to be cooled. There are also two mesh pockets lining the top of the cooler. It is most appropriate for small gatherings and occasions as it can only adequately accommodate about 1 or 2 people. It can be purchased in five different colors, including red, blue, green, gray, and camo, providing you with a lot of variety, and allowing you to choose the color that best represents you. As far as construction goes, it is very well put together. Its seams are heat welded, ensuring that they wont tear and allow leaks. The outside of the cooler is cushioned and resistant to sweating, providing you with maximum comfort any time you’re carrying it. Its interior is heavily insulated with thick insulation capable of keeping drinks cool all through the day. The interior also contains a removable hard plastic liner. This liner will give the cooler structure if you want to pack sandwiches and produce, but can be taken out to accommodate as many drinks and as much ice as the cooler can possibly store. The interior also contains antimicrobial properties that are resistant to mildew and odor, keeping it sanitary and pleasant-smelling for the duration of its existence. For carrying purposes, it has a large, padded, adjustable shoulder strap that will provide you with maximum comfort. Online reviewers love it for its ability to carry entire meals, with many reviewers noting that they use it at work and are able to easily pack everything with room to spare. Reviewers also give it credit for its overall construction, stating that it can withstand a great deal of wear and tear while losing none of its ability to cool food and beverages. Some reviewers remarked that it’s not able to pack 16 cans while the hard plastic liner is inside of it, stating it was only possible when the liner was taken out. Other reviewers complained that it would leak when the plastic liner was not used, noting that the ground below it would become soaked with water once it made its way through the insulation. 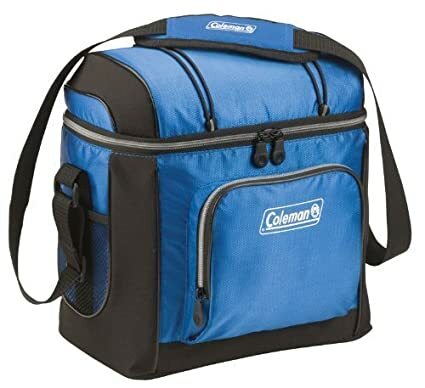 All in all, the Coleman 16-Can Soft Cooler With Hard Liner is a great lunchbox style soft cooler to take to work or school. With the ability to keep food and drinks cool for extended periods of time, it is a safe bet when looking for a cooler that can pack all of your meals for a day. If you’re looking for a high quality way of packing food and drinks, you should definitely take a look at the Coleman 16-Can Soft Cooler With Hard Liner. It goes for around $15.00 on most online retail sites. AO Coolers is a company that specializes in making soft-sided coolers and soft-sided cooler accessories. All of their products are made with special attention and care, resulting in some of the premier coolers on today’s market. 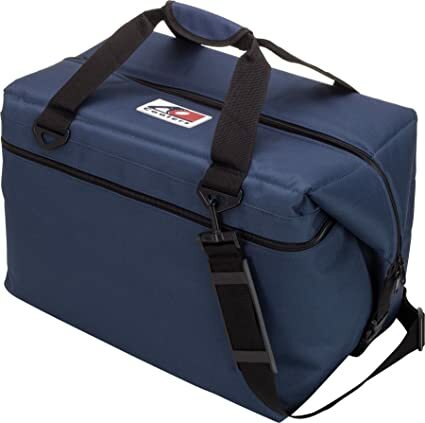 One of their many great soft coolers is the AO Coolers 12-Can to 48-Can Soft Cooler; a shoulder style cooler that provides easy portability as well as excellent insulation. Weighing in at around 3.5 pounds when empty, it comes in several different sizes. These sizes include 12 cans, 24 cans, 36 cans, and 48 cans. This variety makes them adequate for just about any occasion. While you can take the 12 can model to work and school as a lunch box, you can take the 24, 36, and 48 can models to large gatherings, camping trips, and the like. A side pocket provides a space to store dry items such as sandwiches, and is rather spacious. Available in several different colors, including red, navy, royal blue, charcoal, black, and camo, this AO cooler is sure to have something to please you. As far as construction goes, it is very solid. Layered insulation ensures that drinks will stay cool for an entire day in up to 120 degree temperatures. This allows you to take it to short gatherings as well as large excursions. Its inside liner is completely leak proof, preventing melted ice from seeping through and soaking your other possessions. With a hand handle as well as a shoulder strap you can either hold or carry it depending on what’s most comfortable to you. The shoulder strap can be removed if need be. When it comes to storing the cooler, it is very easy to bunch up and stuff into compact areas. It won’t take up a lot of space when not in use. Online reviewers laud it for its insulation quality, with one reviewer stating that it keeps ice from melting even when used during long fishing trips under the sun. Reviewers also give it credit for its overall construction, noting that it does not leak at all even after ice has melted. A common complaint among online reviewers is that its strap is not very comfortable. When the cooler is full, the strap tends to dig into the user’s shoulder. Some reviewers complained about its shape, stating that it’s very deep, but not wide enough to store some of the items that they wanted to store. All in all, the AO Coolers 12-Can to 48-Can Soft Cooler is a high quality cooler capable of carrying just about as many items as you desire. If you want to use it for large, outdoor gatherings, the 48 can model will suit you just fine. At the same time, if you want to use it as a lunchbox, the 12 can model will do an excellent job. These coolers are great for all purposes. It’s up to you to decide what your purposes are and purchase accordingly. They go for around $65.00 on most online retail sites. Maybe you don’t need a cooler with the greatest insulation this world’s ever seen. Maybe you just want something that will last you until lunch time. There’s no use spending a lot of money on something that you don’t need. Fortunately, there are a great deal of soft coolers out there that can do just enough to get by, and do so for a very affordable price. One of these is the Coleman Soft 14 Can Man Cooler. With a 14 can holding capacity, it is a perfect sized cooler for work, school, and small gatherings. It also contains two mesh pockets as well as a Velcro pocket for storing dry and non-cooled items such as sandwiches. It’s available in two colors, including lime and blue. Construction wise, it’s rather simple, yet effective. A small hand handle makes it easy to pick up and transport from area to area. Its exterior material is soft and flexible making it easy to store and carry around with absolute comfort. Providing a good deal of insulation is its stellar interior. Smooth and easy to clean, it carries anti-microbial properties that will keep it sanitary and fresh-smelling at all times. To strengthen its construction, heat-welded seams prevent water from escaping its inside and soaking the surrounding area. Online reviewers love it for how thick the insulation is, noting that it’s a perfect cooler to take to work every day. Reviewers also credit it for its durability, stating that it can take a lot of wear and tear without surrendering any performance. Some reviewers complained about the zipper, noting that it would get caught in the fabric when trying to unzip it. Other reviewers had negative remarks about its soft interior, but that has more to do with personal preference. Overall, the Coleman Soft 14 Can Man Cooler is a very high quality product for a very affordable price. With thick insulation and a very easy to handle to construction, it’s a very functional soft cooler at a very affordable price. 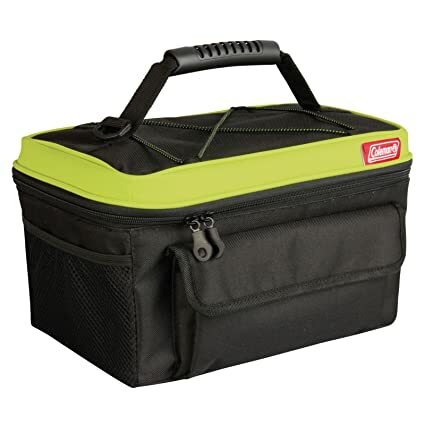 If you’re looking for something to pack your lunch in for work or school, the Coleman Soft 14 Can Man Cooler is definitely something you should take a look at. It is available for around $20.00 on most online retail sites. There are, in general, three different types of soft coolers. These types include backpack style, lunchbox style, and shoulder strap style. Each of these different styles provides you with different benefits, while also possessing different setbacks. The backpack style is essentially a cooler with two shoulder straps attached to it. These types are appropriate for situations in which you will be carrying large amounts of drinks for long amounts of time. They will distribute weight evenly across your back, reducing shoulder soreness, and providing you with greater comfort. They also keep your hands free so that you can hold other items. The drawback to this type is that it’s often more expensive than the others. The lunchbox style is essentially just an oversized, insulated lunchbox. It’s most appropriate for carrying food and drinks for one or two people. It’s not the type of cooler you would bring to a large party, but what be perfect for a picnic in the park. The shoulder strap style can typically hold a lot of food and drinks; usually around 30 cans of beer or pop. It’s worn over the shoulder, allowing for easy transportation. Due to its soft build, can be stored away compactly without taking up much space. Which style you choose is based on what you plan to use it for. Backpacks are good for hiking and other mobile activities. Lunchbox styles are good for picnics. And, shoulder strap styles are good for large get-togethers. Insulation is clearly an important part of any cooler. And, generally speaking, more insulation is always a good thing. The problem is that more insulation is usually going to cost more money. If you’re only planning on using the cooler for short amounts of time, there’s no reason to spend a great deal of money on extra insulation. Minimum insulation will do the job just fine. However, if you plan on taking the cooler to long parties or on long hikes, you’re going to want to find one with a lot of insulation. There’s no hard and fast way of determining insulation value. Claims made by companies have no way of being numerically justified. But, generally, more expensive coolers will provide more insulation. This is because they typically possess higher quality construction. Usually, the thicker the insulation is, the better value it will provide. This is not always necessarily the case, but is often true. To get a truly good idea about a cooler’s insulation properties, it’s important to look at online reviews and to do as much research as possible. Soft coolers come in a variety of different sizes. Some are for personal use, and allow enough room for about 6 cans of pop or beer, while others are for transporting enough pop and beer for large groups of people. These types of coolers can usually fit 24 to 30 cans. If you buy a person cooler, it’s probably not going to necessitate a backpack strap. It will be light enough to carry from place to place with one hand without any struggle. If you buy a spacious cooler, it’s going to be a lot heavier when full. While typical shoulder straps will work just fine when carrying these for short distances, backpack style shoulder straps would be a lot more comfortable when carrying them long distances. In any case, it’s important to consider just how much you plan to fit into the cooler. To do this, you must consider its primary purpose, and what you hope to get out of it. One of the primary purposes of purchasing a soft cooler in the first place is its portability. While they can be kept stationary, soft coolers will best serve people who are looking to keep things cool on the go. There are several things to consider when you’re evaluating its portability. First, you should consider what exactly you intend to use it for. If you want to use it for hiking, a backpack style is probably your best bet. It will reduce strain on your shoulders and allow you to carry a lot of food and beverages. If you’re just going to be carrying it for short amounts of time, shoulder strap and lunchbox styles will suit you just fine. Another thing to consider is how well the cooler can be stored when it’s empty. Backpack and shoulder strap styles are typically softer than lunchbox styles. They can be stuffed into small, compact areas, reducing the amount of total space that they take up in storage. You should choose based on your own needs and purposes. A soft cooler is a great thing to have if you like to hike, picnic, or transport food and drinks over long distances. Because they can conform to your body, they are a lot more comfortable than typical hard coolers, providing greater convenience and ease. A soft cooler can solve a lot of your food and drink transportation woes, but to ensure that it does so, it’s important to choose the right one. Consider what exactly you’ll be using it for. Think of how much space you’ll need, how much insulation is required, and how much you’re going to be traveling with it. After you’ve done this, you can choose a great soft cooler that will suit all of your needs and purposes.